Nancy found a new Sony Cyber-shot at Best Buy that takes the picture when you SMILE. Now this would seem a good thing, but how does it know when the person is smiling? lol I will be checking it out this week. So I am still searching. 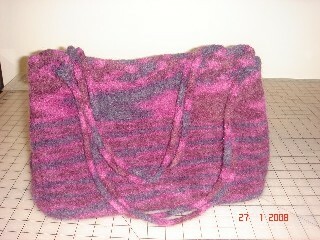 This is a felted purse out of the Oregon Tote pattern by Knit Kit and made with Plymouth Outback, Mulberry color 959. My first felted project. This is a felted carpet bag out of the Making Waves Carpet Bag pattern by Chris Bylsma and made with Plymouth, Galway, bright blue. My second felted project. This was my first attempt at applique embroidery. I used the Hatched in Africa, Cuddlesome Critters Applique, Set 1 I was just practicing so I used old jeans and when I got done I liked them so well I wanted to make something out of it. So I made this wall hanging. See what making an apron will get you? A new kitchen helper. The question is will she clean up after she makes a mess or will I? I found a really neat place online that has a large selection of Asian fabric, Moda, Hoffman and other prints. eQuilter.com They have a lot more than Asian prints too.